And they lived happily ever after in the deep blue fish sausage sea . . .
TomInSkokie wrote: Midnight Moon aged goat cheese, similar to gouda, by Cypress Grove Creamery in California, on sale at Mariano's. One of the best cheeses I have ever tasted. I started buying this at the Farmer's Market in the loop about 10 years ago (when it was harder to find locally). Still one of my favorites along with Jasper/Cabot's much pricier clothbound cheddar (textural similarities although the cheddar is closer to parmesan in texture and flavor - I have a cheese snob friend in France who tried it once on a visit here and could not believe it was an American cheddar). G Wiv wrote: And they lived happily ever after in the deep blue fish sausage sea . . . I definitely need to check that out. I've had corn ice cream in a restaurant, but a sweet corn ice cream sandwich sounds like something I can't miss. 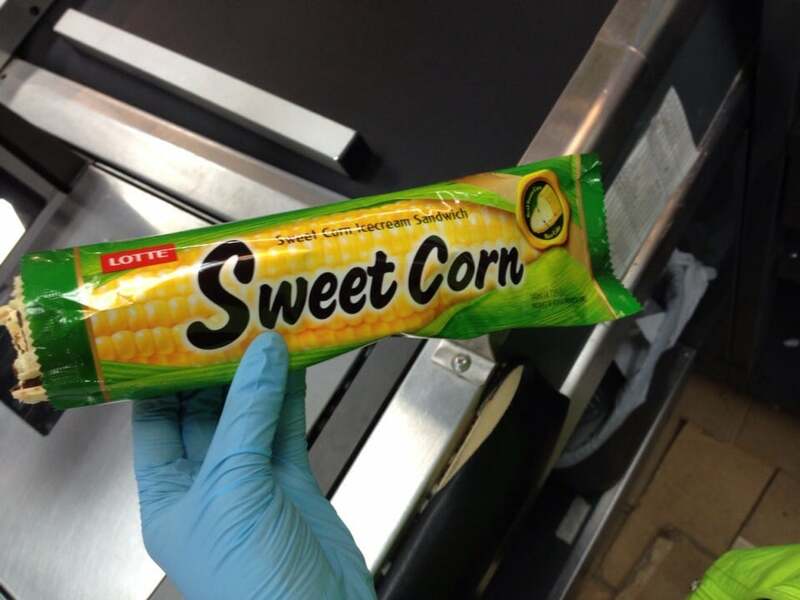 At the Corn symposium, we served corn ice cream from Village Creamery near H-Mart. That's right. I'd forgotten that we had it there -- and it was excellent. Okay -- first off, this is NOT a discovery I have tried and not one I intend to try. Nor do I recommend anyone else try it. But I still thought it was worth passing along, as I can imagine few other places it will be fully appreciated. In China, they now make vegan/vegetarian pigs' intestines!! Made from a base of konjac (which is stinky enough to imaging being appropriate), the ad uses such descriptors as "vivid" and "secret recipe" (I bet). Long ago, when I was roughly college age, as was true of many broke kids, I ate a lot of instant ramen. Back then, the choices were beef, chicken, vegetable, though the main flavoring ingredient was salt. Now, with all the great ethnic places popping up all over the area, I have discovered that pretty much everyone likes instant ramen noodles, and I've had a vast array of new flavors, from green curry to kimchi and beyond. But the one I tried this week both amused me and pleased me. Lucky Me! Brand Bulalo -- Beef and Bone Marrow Flavor, from the Philippines. Somehow, bone marrow seems so unlikely a flavor for a cheap package of ramen noodles. It admits right up front that it's artificially flavored, but maybe it's a tribute to all those companies trying to make fake meat for vegetarians -- because this was remarkably beefy with pretty convincing hints of bone marrow flavor. I'll probably buy this again. Because I still need cheap meals in my life. That's different packaging than I found (mine was the small rectangle of noodles), and while I enjoyed it, I don't think I'd say I'd want $129 worth of it. My first search online turned up pages of recipes for bulalo. A "ramen rater," who said he loved it. And about 30 other brands of instant bulalo -- no idea this was such a popular dish in the Philippines. "The noodles were a little on the spongy side at the end of the three minutes, but I found after a minute or two they became a little better. The broth has a nice beefy flavor. 3.25 out of 5.0 stars." My most recent discovery is not a food but a YouTube food show. Did a search, and it didn't appear anywhere on LTH, so I thought I'd share it -- but I want the job these guys have. They eat food at three different price points and decide which is the most "Worth It" -- which is the name of the show. It's a lot of fun. Some of the high-end food is crazy expensive, but it's fun to see it all. 17 million subscribers, so I'm clearly not alone in enjoying this guilty pleasure. Mom and I watched the fried chicken followed by brunch. All the places selected I would want to visit depending on mood and how much I want to spend. There were no dogs in their selection process at all. My kids turned me onto Worth It about a year ago. I really enjoy it too. My son and a couple of friends did the fried chicken/caviar at momofuku, and said it was really good, though not necessarily worth it. Yes -- I like fried chicken and I like caviar, but just piling caviar on fried chicken doesn't appeal to me much. I'd pick Red Rooster, of those three -- because I've had Marcus Samuelson's food before and think he'd always be worth it. Today, at Tony's, I picked up a package of Chaakri Roasted Crispies. Under the line with the specific flavor (I got Peppery Oat Khakhra), it says "Empowering under-privileged women in rural India." The back of the package goes on to say that the treats come from a charity called Shramic Naan Sangh. So doing good buying snack food. As for the crispies -- they are, very. Just slightly thicker than a sheet of paper but less fragile than one might expect (a bit stronger than a potato chip). The ingredients in the type I bought are oat flour, wheat flour, pepper, cumin seeds, vegetable oil, salt, water. And that pretty much tells you what they taste like, too -- oats and spices, with enough pepper to give it a bit of bite. A fun change of pace when only something crispy will do. Today, in the "reduced for quick sale" section of the refrigerator case at Valli in Hoffman Estates, I saw a few plastic containers of flavored butter from Isola -- one porcini mushroom, the other Italian truffle. They were marked down to 99 cents, so easy decision. Just got home and tried the Italian truffle. Not going to replace shaving actual truffles over your food, but very nice. And in addition to truffle oil, it has actual truffle in the butter. Didn't look to find out what the full price would be if it weren't about to out date, but I'll look for it next time I'm at Valli. I was invited to a lunch at Quartino Ristorante in downtown and they had these interesting Parmesan mini blocks in its own plastic grater on every table. I have never seen such a thing sold as its either already shredded Parmesan or at fancy restaurants the waiter will come around shred the Parmesan cheese for you. 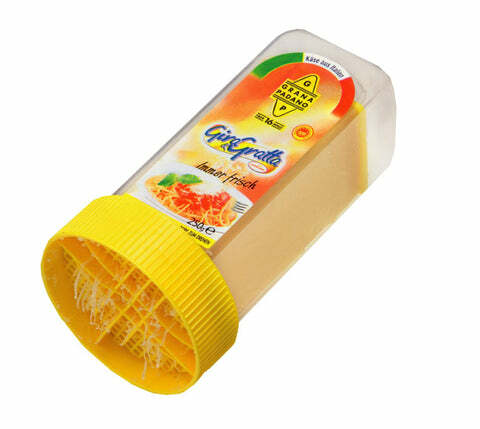 When I got home I looked up the brand and item and found this from an Italian company (Agriform) and cheese inside is called Grana Padano which tastes a little milder than Parmigiano Reggiano. I love those things! Stopped at Quartino for a snack on Saturday and was reminded how much I love these and want to seek one out for home. I think I've seen them at Conte Di Savoia, but don't quote me on that. mtgl wrote: I love those things! Stopped at Quartino for a snack on Saturday and was reminded how much I love these and want to seek one out for home. I think I've seen them at Conte Di Savoia, but don't quote me on that. Thanks for the tip on Conte Di Savoia. Usually brick and mortar stores are cheaper for this kind of specialty item than ordering it online.